bodhi Wrote: ------------------------------------------------------- > veriqster Wrote: > ------------------------------------------------------- > > tried installing Debian overstock software and > it > > was getting stuck during boot at some point. > > Redid the rootfs usb stick and now all I get is > > some gibberish with Reset IDE SATA PHY not > ready. > > It does look good at the beginning. The SATA and > USB are scanned by u-boot to look for the kernel > files. So it is normal to see SATA not ready if > nothing plugged in other than USB. > > > > It also would not stop the boot if I press any > key > > during the 10 to 0 countdown at the beginning > of > > the process. > > > > Either your serial connection TX (on WIndows box) > to RX (on Pogo Pro) is faulty, or the > communication parmaters are not correct. 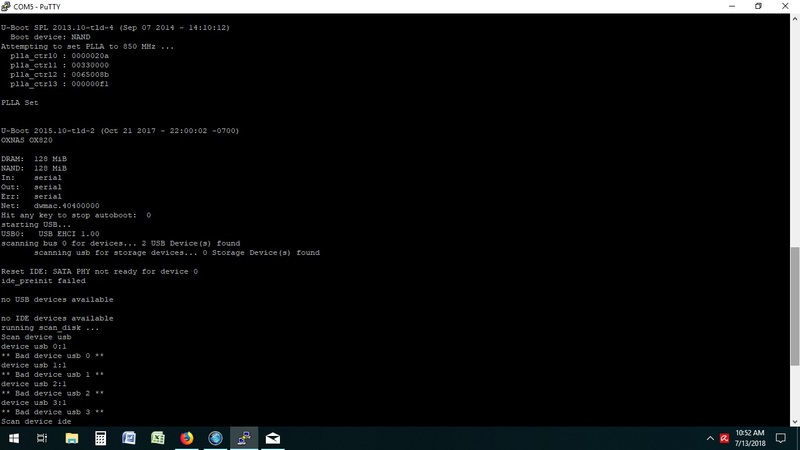 > > > I've attached a .jpg of the putty serial > > connection messages. > > > > Also, can someone tell me how to select all > those > > messages in Putty as text? It would probably be > > much easier to post than making a screen shot > and > > than attaching jpegs. > > Highlight all the text and copy by > right-click-Copy or Control-C, and then paste to a > notepad by right-click-Paste or Control-V. > > The boot looks OK so far, but I need to see the > rest of the log to see why it got stuck.